In 1919, an English man stepped off of a boat onto the soil of India. This was Colonel Philip Johnson, one of Britain’s few tank designers. Although Johnson would never design a tank that was accepted into service and had a habit of designing what he wanted, not what was required, at the time he was the Government’s only tank designer. He was in charge of the Department for Tank Design, and had been tasked with undertaking a study into the use of Tanks in the heat and rugged terrain of India, and the north-west frontier. Johnson’s report filed in 1920 suggested that the use of tanks in those conditions was entirely possible. He went even further to suggest a family of vehicles all based upon a common chassis would be needed. The family was to consist of a tank, an amphibious vehicle, a supply carrier and gun carrier variants. As far as it is known, only the tank version, known as the Light Tropical Tank, and the Supply Carrier were built. A single photo of the Light Tropical Tank has survived. However, a good deal of information can be extracted about the design of this little-known vehicle. The engine of the vehicle is placed at the front of the vehicle, on the left side. It was a 45hp Taylor engine. Interestingly, the vehicle has a rear transmission. This front-mounted engine rear-mounted transmission combination is quite peculiar in tank design history, although it is shared with the famous Medium Mark A Whippet and the following Medium Mark I and II. The gearbox was of the sliding bevel type, with four forward and one reverse gear. Another interesting feature, reminiscent of WWI-era armored cars, is the placement of the radiator intakes, which are situated at the front of the vehicle. 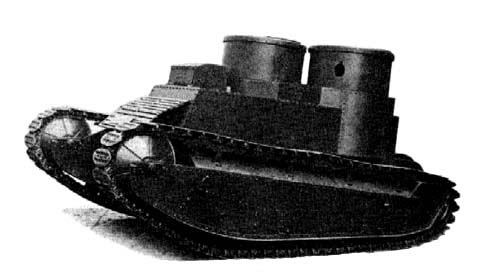 The suspension is almost impossible to observe due to the poor contrast of the photo and the large mud chutes which cover the outer part of the sides of the tank. It consisted of coil springs attached to small roadwheels. The vehicle has a solid front idler (although the supply carrier has a different, pressed type of idler) which can be adjusted to change the track tension. The drive sprocket is at the rear. Based on the pictures of the Supply Carrier, which is quite similar in design, five return rollers are also present. It could reach 15 mph (24 km/h) on road, with half that off road (7 mph or 11 km/h). The superstructure of the vehicle was composed of two parts. The front part, containing the engine and the driver’s location, was quite boxy. However, its rear part was irregular in order to make room for the offset turrets. The front seems to have been slightly angled, but the rest was vertical. The rear part of the superstructure comprised the fighting compartment, being taller and irregular in shape. The right-hand side extended more to the front than the left side. Again, it comprised vertical armor plates with almost no angling. While it is hard to observe from the single available picture, it seems as though the fighting compartment also extended over the tracks, thus giving more internal space. Behind the fighting compartment was an armored cover for the transmission. The Light Tropical tank had two turrets mounted to the rear, on top of the fighting compartment. The two turrets were offset due to the placement of the engine, and resembled those on an Austin Armoured Car, although no direct link between the two vehicles is known. No weapons were fitted but it is highly likely they would have been a pair of machine guns. The driver was placed on the front right, having a raised compartment just in front of the right-hand side turret. This was low enough so that the weapon could traverse over it. It is unclear how the crew accessed the vehicle. The armor was flat and vertical, consisting of riveted rolled armor plates. After the design work was done, the plans were turned over to Vickers who started construction at their Erith plant. On the 7th of October, the right hand track was connected to the machinery of the tank and run for an extended period while the tank was lifted off the floor. At the time, the left hand track was still awaiting connection. Five days later, the tank was completed and run for a very short distance. Even this short run showed a number of defects which needed work. By the end of the month, more involved trials were carried out and showed some problems with the tracks, which were deemed noisy and unreliable. Throughout November, further mechanical problems arose, including within the gearbox which had to be sent back to its makers for fixing. 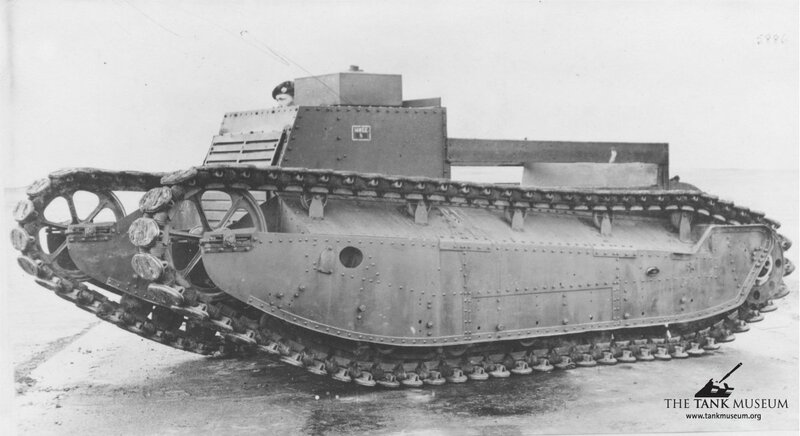 These mechanical problems were still plaguing the tank in June 1922, when a hopeful internal report at Vickers suggested the tank would be complete in about two months. In July, a notification was sent that a second tank had started construction. 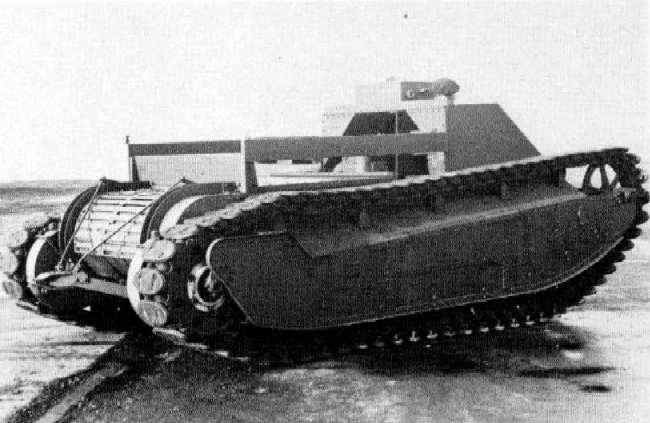 By the 10th of November 1922, the tank had been turned over to the British army and was undergoing testing at Farnborough. During these tests, the tank had several persistent problems, such as the cables that formed the suspension stretching and fraying. The bogies were considered very weak and kept on moving out of position, causing damage to the tracks. The tracks themselves had almost constant problems with the rivets in them shearing off. Despite all this, the British army did convert the tank to use a steering wheel instead of its original levers. After 238 miles (380 km) of testing, the tank was abandoned. In 1923, after the series of failures, Philip Johnson’s tank design department was closed down, and Johnson disappears from the records. Of the Tropical Light Tank, no further record can be found. It was likely scrapped, or used as a range target. There are two documents involved in creating this article. However, they contradict each other when it comes to dates. The dates used above came from “E.2011.1667 Vickers tanks notes” held at the Bovington Tank Museum. However, a second document held at Bovington, and quoted by David Fletcher in Mechanised Force, states that the Light Tropical Tank had been delivered for testing by the army in June/July 1922, a time when the previous document still had the tank at the Vickers works at Erith. Suspension Spring cable, and Rackham steering clutches. Armament Likely two machine guns in two separate turrets. Mechanised Force (ISBN: 0112904874), Page 5, David Fletcher, HM Stationery Office Books, 1991. Unknown document, Bovington tank museum.